With this prayer to cancel debts you can attract abundance through your thoughts and energy, just read it a couple times. If you want to attract abundance and prosperity to yourself and your loved ones, you just have to say this prayer of attraction law. It is one of the most powerful prayer I have used. the results were not instantaneous, but few weeks later I got the job for which I had studied, very well paid, after being unemployed for months. From then on I never had economic problems like before. “I come from the light and I come from the abundance of God. I inhabit the same heart as God. I go to unlimited abundance. Since God is my source of light and abundance. I decree that everything I think and all the energy I release will attract unlimited abundance in any aspect of my life. I decree that I don´t have to ask for anything because I am around the abundance. Because I come from the same light of God, I will be able to create the same abundance that he gave us. Amen”. You have to perform this prayer when you are in a very positive mood, no matter what time of day it is. If your mood is negative at that time, the effort will not help you. Abundance comes to you only if you are optimistic and positive. 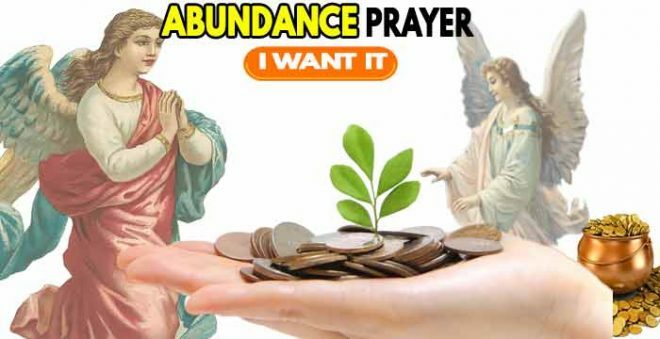 You have to be realistic, the abundance you attract with this prayer will not be so much to make you a millionaire, but to end your debts, mortgages, and improve in general all aspects of your life.